Everyone who has ever been camping at a campground knows showering can be unpleasant. One reason is that you may have to walk to the outhouse and if your camp site is not close it can be quite a hike. Second you may get there and have to wait for a shower if there are others showering at the same time. Last is the cleanliness, yes the shower rooms may get cleaned often, but it's never as clean as your bathroom at home. For those of you that own a RV and are fortunate enough to have a bathroom shower, you know how lucky you are, but just like everything else in your RV, it is probably on the smaller side. Here are 5 RV bathroom accessories that will not only help with the functionality of the shower but also make it more comfortable. Adding the Jobar RET4776 IdeaWorks Super Grip Suction Mount Handle offers a little extra stability when stepping in or out of the bath or shower. The suction mount allows it to attach to any non-porous surface; the release lever even allows it to be easily lowered to tub height for those lucky enough to have a bathtub in their RV. With a color change indicator there's no guesswork about whether it's securely mounted or not. If you'd like a little extra elbow room in your shower, how about adding the Stromberg Carlson Extend-A-Shower Expanding Shower Rod? With 30% more elbow room, this RV accessory will make showering much more comfortable. It can even be used to hang up your towel to dry and then it folds neatly out of the way until it's needed again. 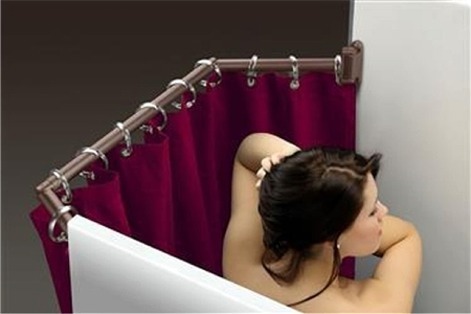 It's even big enough to allow you to hang a stylish shower curtain just like at your other home. Now that you have a spacious new shower, add a luxurious new updated water saving shower head. The Oxygenics 26481 Brushed Nickel RV Shower Head with a Smart Pause feature will let you enjoy a longer shower without the worry about running out of hot water. When it incorporates a body massage feature, it's just that much more enjoyable. If you have the space, another great RV accessory, perfect for upgrading your bathroom shower is a bath tub. The Lyons DT0146L12 46" X 24" White Full Bath Tub is a good size, we do carry other sizes also, including one with a seat in the tub. If you have young children you may have difficulty with them in the shower, this tub will make the bathing process much simpler. It will also help by keeping the water off the floor when showering. If you have a tub or just installed one, then the Golden Ideas Tidee Tubb Splash Guard would be a great accessory to add. Kids are notorious for splashing and when floors get wet they can be dangerous. Slipping and falling can cause an injury but with this product it will keep the majority of the water in the tub preventing this and potential damage to the floors from sitting water. Well, there you have it: a bathroom that's stylish, comfortable, and safe. You may not even miss the shower you left behind. If you have any questions about our products, contact us and we will be happy to answer them.